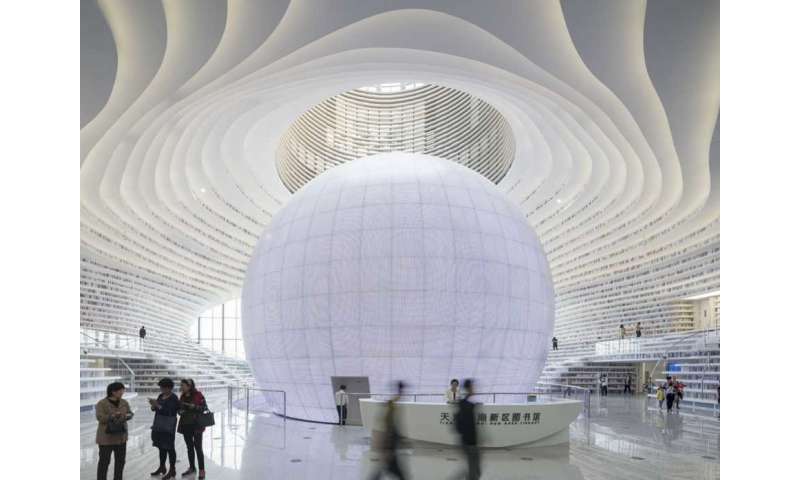 In 2017, the most viewed architectural project in the world was the Tianjin Binhai Library. The building is part of an urban project designed to revitalise the port district of an environmentally grim but economically boisterous Chinese harbour city. I believe that the architects of this library have not created a building, but instead have produced above all the image of a library: a spectacular interior that consists seemingly only of bookshelves, sculpted and flowing, functioning not only as shelves, but as seating, as steps, and as louvres. The result is captured in pictures that resemble a kind of science fiction fantasy. The library was described by the media as a runaway success. Certainly no one could object to the government of Tianjin making a library the centre of their urban renovation. Yet it is odd that the most popular images online remain the digital renders designed to advertise the building before it was built, and not photos of the actual building. It is as if the project, even after completion, would have preferred to remain in the realm of fantasy. Further proof of this can be found in the minor scandal that broke out a few weeks after the opening, when visitors reported that the upper shelves did not contain books, but rather just flat wallpaper with book spines printed on it. This merely confirms that this is an architecture of images. It surprises no one that the biggest architecture websites get more visitors than the most famous buildings. ArchDaily, for instance, gets about as many visitors in a month as Tate Modern does in a year. It is arguable that we've been encountering architecture as image first, and as shelter second, for a long time. But the particular type of image with which we consume architecture has changed since the advent of the digital render. Such renders do not show new ways in which we can live, but new ways in which we can desire to live, which is a tremendous difference. A year on, the Binhai Library itself is no longer news – we've kept scrolling. The rules for seductive renders determine how easily a project is disseminated, and are starting to feed back into the way architecture is designed. Where photography once demanded clearly defined surfaces, right angles, and atmospheric lighting, the render of the past few decades encourages curvilinear geometries, visual allusions, and a kind of exaggerated artificiality. However, digital transformation not only has an impact on architecture, it seems to me that this digital transformation places architectural history at an impasse. Since Alberti, the drawing has always been understood as the artefact, the bridge between the architect's mind and the built structure. To understand a building, a historian turned to the drawings. Now, in everyday practice, hand drawing has been displaced by digital models – but a digital model is not a drawing; rather, it is a data set that can be made visible in a number of ways. If architectural history was previously preoccupied with drawings and thus with the ideas of architects, how is it to serve the profession now? Indeed, what sources can historians of the digital age even turn to, given the woefully inadequate state of current digital conservation practices? File types become unreadable, links rot and media formats fail. CAAD architecture of the late 1980s is in many respects less well documented than church architecture of the fifteenth century. This undermines the existing toolset of architectural scholarship. Against this backdrop, how should architectural history education look? Technological progress throws up plenty of questions for architecture and architectural history. It is high time to come to grips with the enormous impact of digitalisation.